This stunning 2017-S 1 oz Proof Silver American Eagle PCGS PF 69 DCAM First Strike is the latest issue in a timeless silver bullion series - the Silver American Eagle Coin program from the US Mint. This coin comes with a "S" mint mark is significant and unique since it is part of a special congratulation set from US Mint. Ever since the United States Mint struck its first Silver Eagle in 1986, the demand for this collection keeps rising among all levels of collectors. Government-guaranteed, made of 99.9% pure silver these coins will always be highly demanded for any level of collectors. The coin is struck in 1 troy ounce size. The Silver American Eagle is legal tender and has a face value of $1 independent of the silver content. This particular coin was sent to the prestigious grading company PCGS within the first 30 days of official issue and verified as a Proof coin - 69, which means the coin has less than two visible imperfections. 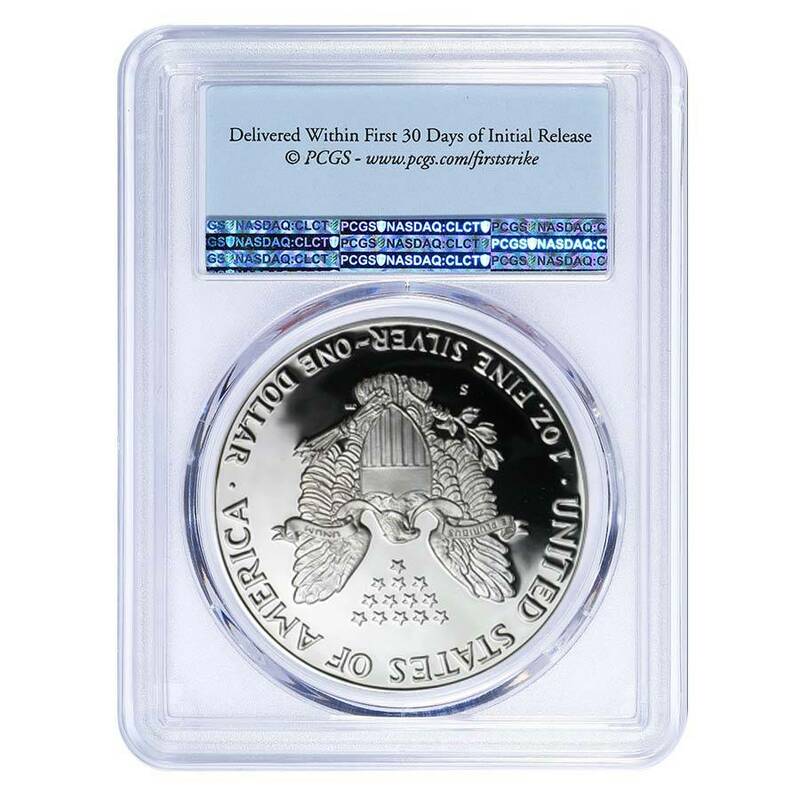 This beautiful 31st American Eagle coin release is extremely collectible and a must-have addition to any coin portfolio and a treasured gift for passionate collectors of the series. Coin contains 1 troy ounce, made from .999 fine silver. This silver coin is a legal U.S. government tender. The purity and weight is verified by the US Mint. Coin sealed inside PCGS Holder, graded as PF 69. Limited mintage of 75,000 only. American Eagle coin housed with a special DCAM Label. Obverse: Displays Lady Liberty moving toward the sunlight while holding a laurel oak in her hand, symbolizing America’s strength. Design by Adolph A. Weinman. Inscriptions include “LIBERTY,” “IN GOD WE TRUST,” and the year of mintage. Reverse: A heraldic eagle is shown below 13 small stars, representing the original American colonies. Inscriptions include “UNITED STATES OF AMERICA,” “E PLURIBUS UNUM,” along with the weight and denomination. 31st release of the most well-known series in American mintage. With Bullion Exchanges, you can feel confident that you will get only high-quality silver! Every silver coin offered in our collection is 100% authentic. 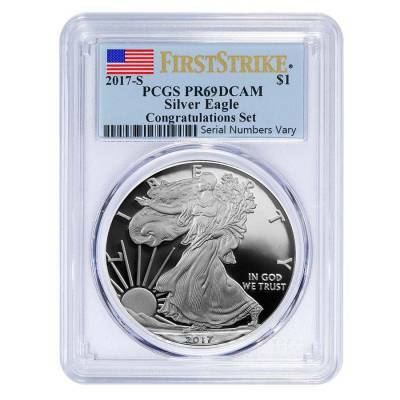 This 2017-S 1 oz Proof Silver American Eagle PCGS PF 69 DCAM First Strike will be safely packaged and delivered to you. For any questions, you can simply reach us at 800.852.6884 or message us, our customer service associates will be happy to assist you. I'm a huge fan of American Eagles. It's my annual purchase. Thank you, Bullion Exchanges for the simple transaction and prompt shipping. This deal is the best! I always prefer certified coins vs. regular packaging, and DCAM is perfect! Thanks! The "S" proof silver eagle from this year is definitely a must-have! Can't wait to have it. For every $1 spend, you will earn 1 Bullionaire Buck which is equivalent to $0.001 off a future purchase. 110 BB = $0.11.